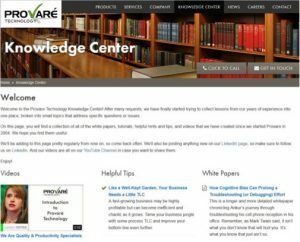 Alpharetta, Georgia, October 24, 2016 – Provaré Technology today officially announces a new Knowledge Center section of its web site. The new Knowledge Center will serve as a single access point for helpful tips, videos, white papers, and similar material that the company has accumulated over its 12+ year history of helping its clients produce superior quality products more productively and profitably. Founded in 2004 and having helped 56 different clients with 104 unique projects or products over its 12+ year history, Provaré has accumulated quite a collection of white papers, case studies, helpful tips, and videos – not to mention the experience to produce more such material for years to come. Provaré already has enough existing material for many weeks of frequent additions to the Knowledge Center, so visitors are urged to come back and visit often. 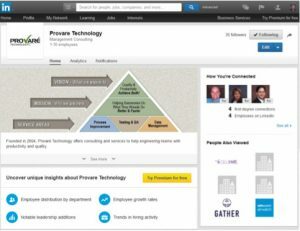 Changes will be shared via the company’s LinkedIn page, so those who are interested can keep up by following them on LinkedIn. Videos will also appear on the company’s YouTube channel, so followers can subscribe to it as well.